For fanatics of PhysX-based fluids, FluidMark has been updated and this version brings many improvements. Preset:1080: with this preset, the settings are the following: 1920×1080 fullscreen, duration of 60 sec, 60000 particles, heavy additional graphics load and multithreaded PhysX synchronized on the rendering. Preset:720: with this preset, the settings are the following: 1280×720 fullscreen, duration of 60 sec, 30000 particles, moderate additional graphics load and multithreaded PhysX synchronized on the rendering. The additional 3D workload allows to smooth results and above all, makes scores more coherent especially when there is a dedicated PhysX GPU. This score is with a GTX 580 alone (actually there is a second GTX 260 but it’s not used for PhysX) and this one is with a GTX 580 (3D) + GTX 260 (PhysX). We clearly see the impact of an additional PhysX card. 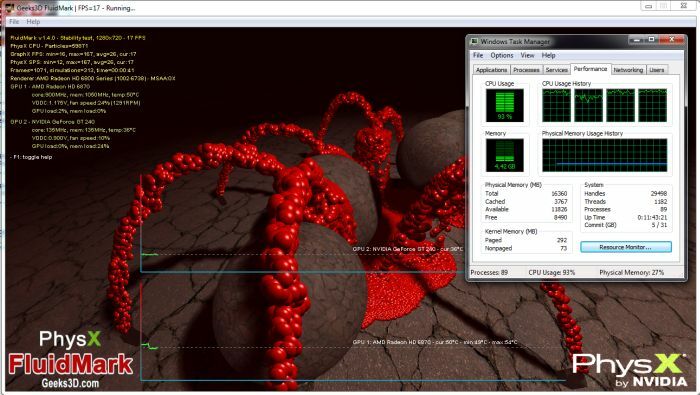 When Multithreaded PhysX checkbox is enabled, FluidMark creates one thread for each fluid emitter for PhysX CPU and does not use PhysX multicore support. The results are the same than with the ones with built-in multicore support. 1/ just click on the Submit button: an anonymous score is send to oZone3D.Net server. 2/ Fill up the nickname field and click on the Submit button: the score is send to oZone3D.Net server along with the nickname, in pseudo-anonymous mode. 3/ Create an account on oZone3D.Net and use this account to submit the score: the score is send to oZone3D.Net server and at the same time is linked to your account. Rank tables will only display non-anonymous scores. FluidMark 1.4.0 main scores page is available HERE. And for Radeon users? If you have a second GeForce card for PhysX, just install the PhysX Hybrid Mod 1.05ff. It works very fine (I used it during the dev of FluidMark 1.4.0: I have a Radeon HD 6870 as main renderer and a GeForce GT 240 for PhysX). 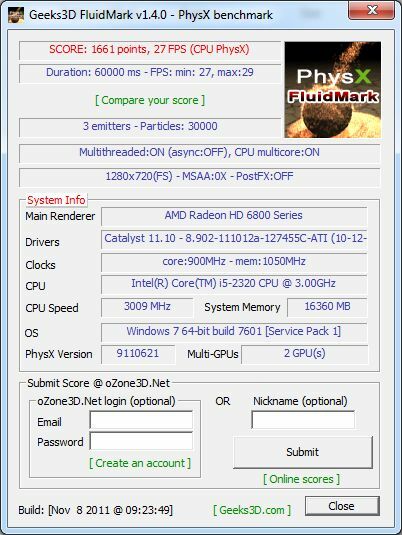 Now if you have only one Radeon card in your PC, don’t panic, PhysX can also run in software mode and can exploit all CPU cores. New: added two benchmark presets (1080 and 720). New: PhysX built-in CPU multicore option added. New: score submission with oZone3D.Net account. Update: the additional graphics load option covers now the whole screen and not only the upper-right corner. Update: revamp of the main startup dialog box (now a bit simpler to use). Update: compiled with PhysX SDK 2.8.4.6. Bugfix: fixed a nasty deadlock that hung FluidMark sometimes at the end the tests. The pixel shader used for the additional graphics load (More graphics load checkbox) is based on the Nautilus demo (ShaderToy). MSI Kombustor 2.2.2 Released, Xmas Competition Edition! Hi. When are you planning to use PhysX SDK 3.x for FluidMark? Interesting, what do you mean by “built-in CPU multicore” support ? Why does it use only one GPU? Any way to make it use both? @Zogrim: yep that’s it. Actually FluidMark 1.3.x already used these options but in a slightly different way. With FluidMark 1.4.0 and PhysX 2.8.4.6, these options seem to work better than with previous versions of the SDK. but I got no error for higher resolution (fullscreen) than desktop 1024×768 in tessmark 0.3.0. You should fix soon this problem for physx fluidmark and also for lastest furmark. also..what does the Nitrus Oxide (N2O) checkbox do? @WacKEDmaN: yes, since I changed my compiler, I noticed some difficulties to submit scores online, seems networking functions have a bit changed between vs2005 and vs2010. To be listed in presets scores, you have to create an account (it’s a really simple operation) and submit with this account. and 1.3.1 FluidMark I PhysX Benchmark Global SCORE: 352 points (60000 ms) – GPU PhysX PhysX: 176 (29 SPS) – GraphX​​: 176 (29 FPS) 7 emitters – Particles: 60000 (1920×1080) why? Benchmarking mode (presets) in FluidMark 1.4.0 uses totally different settings than in FluidMark 1.3.x. There’s no direct relation between v1.4.x and v1.3.x scores. That why I created new score pages. @nuninho1980: yes I saw your bug-report and I will look at is asap (according to other feedbacks, I have the same kind of bug in the latest GeeXLab). If I enable Aysnc rendering on my 5850 with 11.10 drivers Aero locks up and runs at a very slow frame rate. do you not have geforce card (8xxx or newer)? because your radeon card doesn’t have physx support!! is there something wrong with 400series physx… ??? I use 6870CF+GT240 to get PhysX hardware accelerate. When PhysX-mod-1.05ff applied, it works on FluidMark 1.0 and 1.2, but it doesn’t work on FuidMark 1.4! 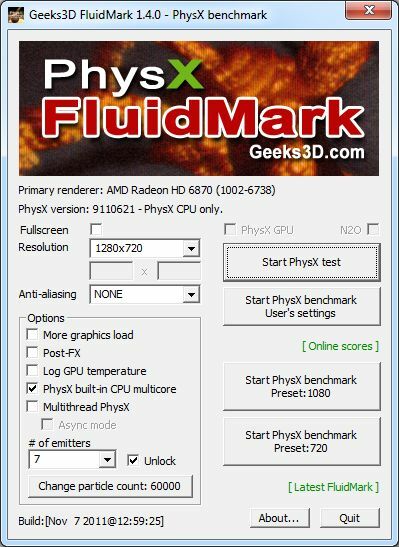 Is there some incompatible between FuidMark 1.4 and PhysX-mod-1.05ff? Thanks! @nextgen: PhysX mode 1.05ff works fine with FluidMark 1.4.0 (I developed FluidMark 1.4.0 with a Radeon HD 6870 + GeForce GT 240). Once the PhysX mod is installed, you have to replace PhysXDevice.dll in FluidMark folder by the patched one from the PhysX mod (check this article out). Any good reason why this doesn’t support hybrid PhysX using the 257.15 beta driver (the one which does allow PhysX acceleration with ATI Gpu present)? note: 1.03 or 1.05ff did not work for me, older 1.1.0 version works perfectly fine with this.